"New Mother's Cup" in gold and beige porcelain (Parma, Glauco Lombardi Museum). 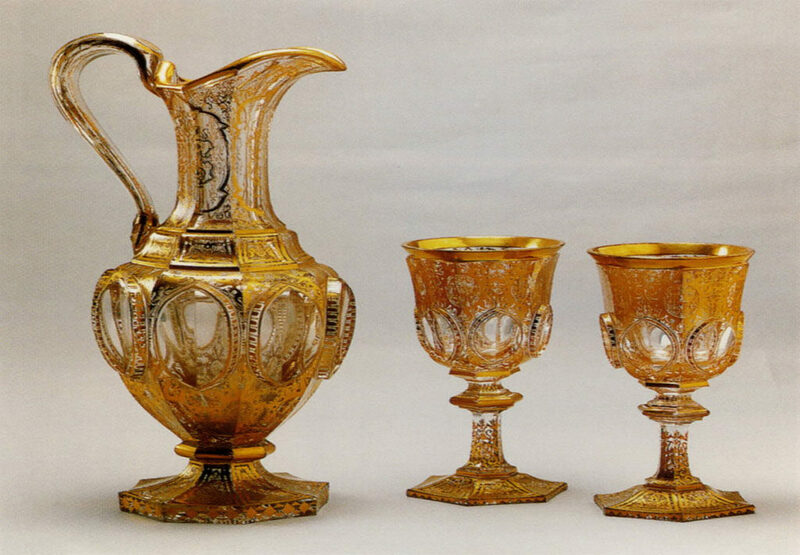 A pitcher and two wine glasses - Parma, Glauco Lombardi Museum. Wine flutes bearing Maria Luigia's monogram (Parma, Glauco Lombardi Museum). 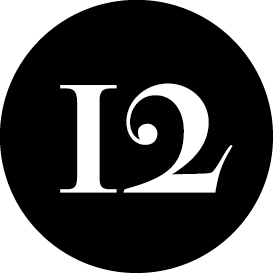 The “Glauco Lombardi” Museum, in whose rooms the Dukes of Parma used to entertain guests, contains invaluable memorabilia pertaining to the Duchess Maria Luigia (1791-1847) and her prosperous rule (1816-1847). 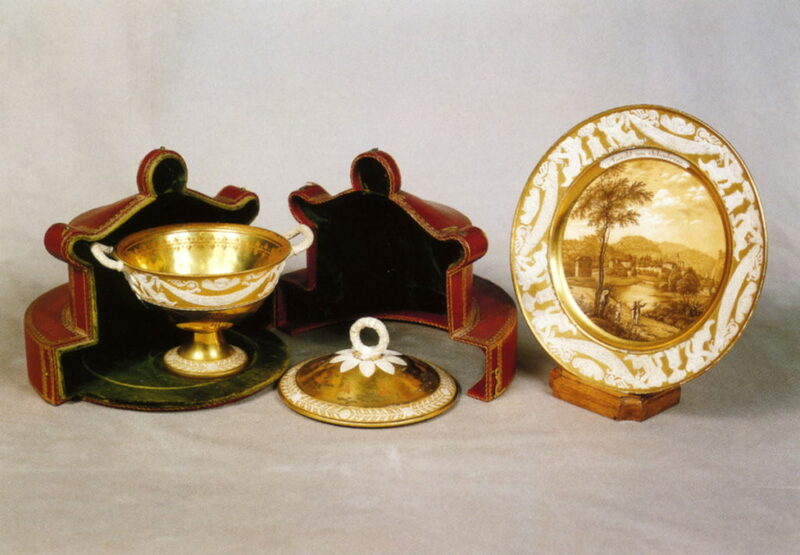 Among the portraits, clothes, furnishings and tableware we also find a plate bearing the coat of arms from Honoré’s Paris pottery factory, part of the ducal official dinner service, a pitcher and two wine glasses by the Viennese manufacturer Lobmeyr, the gold and beige “New Mother’s Cup”, from the Dagoty porcelain factory in Paris, used to serve the first broth to Marie Luigia after the birth of the King of Rome, and the magnificent Empress’ centrepiece, in gilt bronze and crystal, attributed to Philippe Thomire (1751-1843) and Jean-Baptiste Claude Odiot (1763-1850). 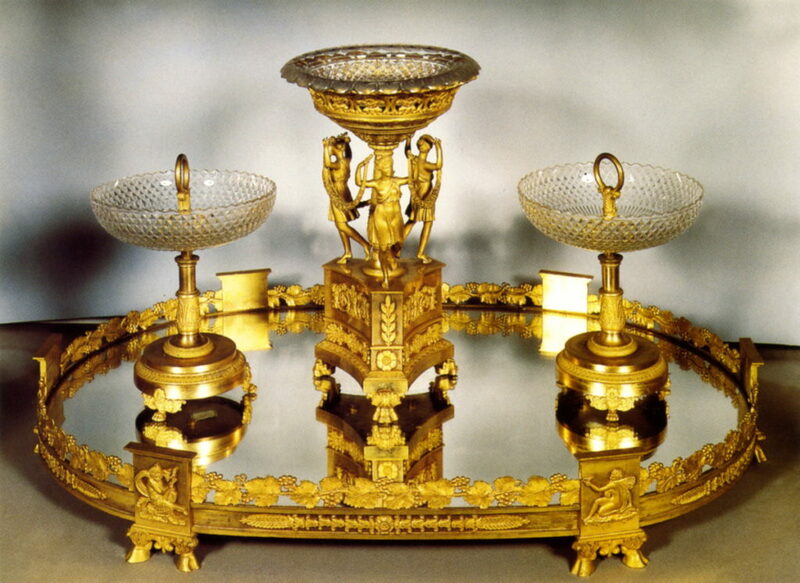 All these elements help us to envisage the elegance of the Duchess’s table.